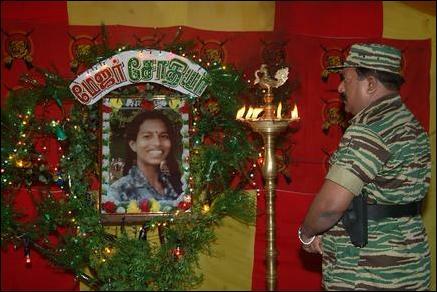 Leader of LTTE, Velupillai Pirapaharan, lit the ceremonial lamp illuminating the framed picture of Major Sothia. Major Sothia's sister sprinkled flowers and garlanded her sisters picture, sources in Vanni said. 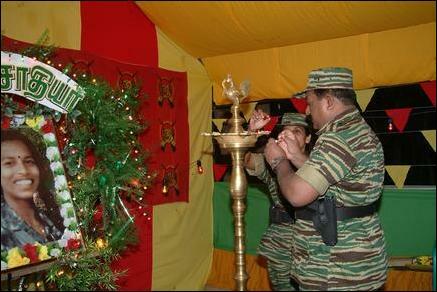 Performances by LTTE women cadre's from Sothia brigade were staged during the rest of the evening attended by LTTE commanders, administrators, fighters and relatives of fighters. 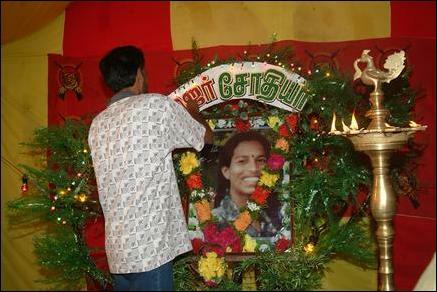 Major Sothia was made the leader of th first women fighters unit started on 26 September 1989, the date which marked the second anniversary of Thileepan who fast to death at Nallur Kandasamy Temple in 1987. "The credit for providing and creating the facilities and opportunities for women to complete a comprehensive military training programme has to be given to the leader of the LTTE... Sothia herself was a strong advocate of independent women's military structure and worked hard to ensure that the idea did not simply remain within the realm of dreams. "Her own personal history was also a great impetus to the women fighters. Sothia, over years transformed herself into an independent thinker, confident and efficient, capable of leading a women's military structure." After six months in her leadership position Sothia caught melingitis and died in an urban medical center on 11 January 1990 when she was 26 years old.